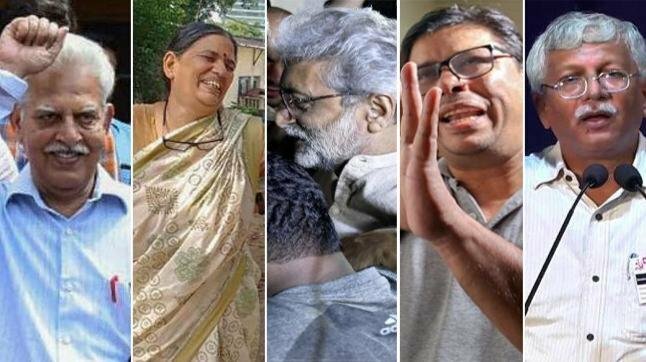 The Supreme Court on September 19 witnessed another gripping hearing in the petition filed by historian Romila Thapar and others seeking an independent probe into the police crackdown and subsequent arrests of five rights activists in connection with the Bhima Koregaon violence. The matter came up for hearing at about 12.15 pm. Senior lawyer Abhishek Singhvi, representing the petitioners, began his arguments, and handed over written submissions to the bench comprising Chief Justice Dipak Misra, Justice DY Chandrachud and Justice AM Khanwilkar. He said that the original FIR (first information report) registered in connection with the violence was filed by a Dalit woman who was witness to the violence occurred at Bhima Koregaon following the Elgaar Parishad. A belated FIR was then registered following a complaint by one Tushar Damgude. The arrests of Advocate Sudha Bhardwaj, Telugu poet Varavara Rao and activists Gautam Navlakha, Vernon Gonsalves and Arun Ferreira were carried out on August 28 after the complaint filed by Damgude turned into an FIR. The senior counsel then argued that the only evidence against the five accused is purported “letters” leaked by the police to the media. He argued that these “letters” are prima facie “fabricated”, and “cannot be relied upon”. “The letters, according to the additional director general (law and order) of the Maharashtra police, are not verified or authenticated. They are yet to be verified. All the letters are purportedly either from or to a ‘Comrade Prakash’. It is the State of Maharashtra’s own case that ‘Comrade Prakash’ is the pseudonym of Professor Saibaba, who has been incarcerated since March 2017 (in Nagpur Central Jail), while the letters are written after this date. It means he is sending and receiving letters from jail. [There is] no forensic verification of these letters. And based on this, the Pune Police says the PM (Prime Minister Narendra Modi) is in danger of Rajiv Gandhi-like incident. My prayer is for a supervisory probe to impart a sense of confidence. As an independent person, I am seeking reassurance and confidence. I will comply with all investigation, but this cannot be allowed,” he told the court. Further, he said, these alleged letters have not been placed before any court, they have not been mentioned in the remand application filed by the police which is supposed to mention what the evidence against the accused is. Experts in counter terrorism like Ajai Sahni have categorically stated that these letters are fabricated, he submitted. Singhvi reiterated that it was impossible to believe that genuine letters that disclosed a conspiracy to assassinate the prime minister were recovered, but no FIR was registered. He then argued that a cloak of criminality is being cast upon the arrested activists where, in fact, the record shows that they have been systematically targeted by being implicated in false cases. He alleged that the activists are being targeted for standing up against the violation of human rights and specifically because they criticised the arrest of the other five persons (Advocate Surendra Gadling, Professor Shoma Sen and activists Sudhir Dhawale and Mahesh Raut) in June. “Varavara Rao, a renowned poet, has [been] implicated in 25 criminal cases, and acquitted in all. You may not agree with his philosophy, I don’t, but you can’t malign him, and say hang him. Arun Ferreira has been implicated and acquitted in 11 cases, Vernon Gonsalves has been acquitted in 17 out of 19 cases, the other two are pending,” he argued, alleging that the “mala fide of the police is evident from the fact that all legal procedures have been flouted. While letters are being leaked as having been recovered from the accused, the process of search, seizure, arrest are replete with illegalities. In gross violation of the law, witnesses – who are supposed to be independent persons form the locality – are in fact Pune Municipal Corporation workers brought with the police from Pune. How is the accused’s right to fair investigation and protection from tampered evidence being used against her supposed to be safeguarded in such a scenario”. “I am not saying that I am above the law. I am only seeking a reassurance of confidence that the investigation shall be overseen by an independent person. I want a supervision, by whatever name it may be called, to impart a sense of confidence,” he prayed. Additional Solicitor General (ASG) Tushar Mehta – as in the past hearings – once again questioned the locus standi of the petitioners, calling them “strangers” and describing the public interest litigation (PIL) as a “surrogate petition”. Once again, Dr. Singhvi insisted that the five accused activists have filed a supplementary affidavit for impleadment. “These are people who have been writing articles strongly condemning the first batch of arrests made in June. They hold a different view which is not barred in this free country!” pressed the senior counsel. Singhvi concluded by referring to judgments under which the court has ordered an SIT probe under Article 32 of the Constitution, including cases of common cause, unfair arrests and a petition by senior lawyer Ram Jethmalani where the courts had been called upon to fulfill constitutional obligation. As Dr Shinghvi concluded, senior counsel Anand Grover, appearing for the five activists arrested in June, began by saying that the two FIRs were filed in same case, but two FIRs cannot be used for investigation. “All the law has been put to the winds. No procedure has been complied with. No authorisation was taken from designated officer to conduct raids or arrests under UAPA [Unlawful Activities (Prevention) Act]. They have only shown a letter from one ACP to another. That’s not feasible for raids or arrests,” he said. “I concur Mr Sighvi’s arguments,” he said. Questioning Milind Ekbote’s bail, the senior lawyer submitted that an SIT should be constituted to bring out the truth. Senior Advocate Ashwini Kumar, who is a former law minister, submitted for petitioners that “it is not a matter of criminal law, the perspective that is set by this case will ensure liberty against unlawful detention and uphold procedures. It pertains to constitutional morality and liberty”. More stringent the law, more the need to make inbuilt safeguard, he said. “Citizens are not obliged in law to forgo his liberty and reputation in criminal jurisprudence. Please ensure that fairness in procedure of prosecution in collecting evidence, and investigation is upheld. Upper court has the power to ensure no person undergoing criminal prosecution is harassed unnecessarily. Matter of liberty, dignity and fair trial must not be hampered,” he argued. “Whenever a person raises social, political and economical issues, they must not be oppressed. We have grown up hearing all poets raising such issues. Poets cannot be oppressed, it would be the end of it [democratic values]. Examples of Azad and Dinkar among others are before us. We know from experience, it is not for want of law, but because of implementation that injustices happen,” he said, adding that “such facts and allegations (in this case) cannot become basis of prosecution”. In his final submission, he said, “Arrests bring humiliation, tarnishes reputation and casts scars forever. Dignity is a must. Question before court is whether the exercise of such power is justified or not. Is it necessary to arrest for prosecution to continue? Liberty and dignity are the core of this petition. Letter attributed to ‘Comrade Prakash’ is fake. Prosecution of activists seems to be mala fide and arbitrary.” Senior advocate Rajeev Dhavan, appearing for petitioners, said that the jurisdiction is not a question, and state has conceded. “Each investigation under CrPC is forgotten. This is a crucial area. The bench must see if there have been massive infractions of the law. Secondly, examine whether there has been a fair investigation – objectively as well as with regard to these accused. We ask which investigation agency goes to the media with evidence. The police went to the media and placed documents. It is blatantly unfair,” he told the court. Dhavan says that in the counter affidavit filed by the State of Maharashtra “using terms like free speech used to disarm us (petitioners)”. “The police say frontal organisation called Kabir Kala Manch funded by Elgaar Parishad to organise event. But over 250 organisations organised it. Terms claims as nonsense. Is reading the name of Kabir Kala Manch the basis for registering an FIR?” the senior counsel asked. Senior Advocate Prashant Bhushan, arguing for the petitioners, rose and began his arguments. “Based on letters planted in the media by the police with allegations of PM’s assassination and providing weapons for Maoists are being floated. These suggestive letters have neither been written nor received, just kept by the accused. What is this? Press conference by the police to leak such evidence makes this an extraordinary case, more extraordinary than precedents where SIT probe has been ordered by the SC,” he submitted. ASG Mehta began responding on behalf of the Government of Maharashtra. “True facts of this case have not been impressed by petitioners. The FIR [was] filed on 8th January by Dhawale. It names six persons,” he responded. The ASG continued his submission, and added that the action against all the accused was taken because “cogent material” was available against them. Except one person Sudhir, he added, no one was arrested immediately. “Source, documents, contents, etc have all been marked to satisfy the Bench’s conscience. Entire search and seizure took place under proper videography. From materials found while searching those five persons arrested in June, we found concrete evidence against the other five. The investigation is being supervised by ACP (assistant commissioner of police) under the supervision of the DCP (deputy commissioner of police). Authorities have conducted searches responsibly. Search warrant was not granted initially by court, this might be contended, but we have order of appropriate court later. We conducted investigation through properly monitored process in the presence of panchas (witnesses),” he explained to the court. The ASG said all the officers involved are willing to file affidavit to that effect. He said that the CPI(Maoist) is a banned organisation and presented purported documents related to the CPI (Maoist) that were recovered. But, the court did not allow him to read the content from the documents aloud, as it might contain military strategy. “From two persons, these docs were found as word files, which can be edited. I know mere possession is not enough to prosecute, but it has relevance,” he added. The letters in question – he said – was written by one “Comrade Prakash” on March 3, 2018. “(Delhi University Professor GN) Saibaba had changed his name from Prakash to Chetan, according to a judicial order,” he claimed. Justice Chandrachud intervened and said conducting research in sensitive areas, by popular institutions, does not mean they are recruiting. “We must draw a distinction between generations of dissent and unlawful assembly. Liberty cannot be sacrificed at the altar of conjectures,” Justice Chandrachud stated. The Bench asked the ASG to go ahead and explain the charges against the accused who were arrested on August 28. ASG Mehta said he is coming to it, as it is connected. “Other than Gadling and Shoma Sen, none of the others have applied for bail, as they know what has been retrieved from them. To open a book which could not be opened, we used an algorithm in Rona’s hard disk to open entire thing. There is a letter regarding a conference in Paris,” submitted Mehta. He observed that the documents submitted by the ASG contained names of prominent universities and social science institutes, and wondered whether all of them were involved in the case. “A clear cut distinction has to be made between opposition to government and attempts to overthrow government by rising up in arms,” he remarked. Making it clear that it will examine the matter with a “hawk eye”, the court adjourned the hearing till September 20.